Tyler the Creator Drops New The Grinch Theme Song, Is It a Secret Eminem Diss Track? Tyler the Creator has released his take on the iconic "You're A Mean One, Mr. Grinch" for Illumination's upcoming The Grinch. The updated holiday classic features Tyler with a smoother vocal attack this time around, leaving behind his trademark growl on top of Danny Elfman's new orchestration. 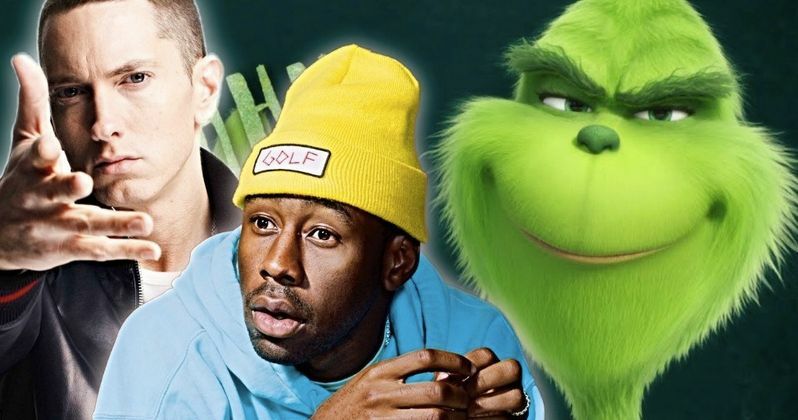 Eminem took aim at Tyler and Earl Sweatshirt last month with the release of his surprise Kamikaze album and there has been speculation that the latest song from The Grinch soundtrack could be a response to Em. Back in 2015, Earl Sweatshirt, who has collaborated with Tyler, the Creator in Odd Future, declared that hip hop fans who still listen to Eminem, "drink way too much Mountain Dew." Later, Tyler attacked Em's collaboration with Beyoncé, "Walk On Water," on social media, stating that it was "horrible. "Eminem wasn't going to let these youngsters take shots at him all day long, so he dissed Tyler and Earl on his latest album Kamikaze, rapping, "Tyler create nothin', I see why you called yourself a f****t, b***h."
Eminem has since apologized for using the homophobic slur in the track, but Tyler, the Creator fans aren't having any of it. Could the new take on "You're A Mean One, Mr. Grinch" from The Grinch soundtrack be considered a diss back at Em? Probably not, since Tyler does not mention him by name. However, one can easily see Tyler and Danny Elfman in the studio channeling all of their energy into creating a diss track in terms of feel. Tyler could actually be singing to Eminem, though he has yet to confirm that at this time. Slim Shady could be the heel and the bad banana that Tyler references in the reimagining of the holiday classic. In addition to Tyler, the Creator's contributions, The Grinch soundtrack also features holiday tracks by Run-DMC, Jackie Wilson, the Supremes, the Brian Setzer Orchestra, Buster Poindexter, Nat King Cole, and Pentatonix. Danny Elfman takes over the scoring duties and also has two solo songs on the soundtrack. Overall, Illumination is going for an updated look and feel for The Grinch, and working with Tyler, the Creator and Benedict Cumberbatch is a good place to start in bringing out a new take on the classic holiday story. Academy Award nominee Benedict Cumberbatch lends his voice to the infamous Grinch this time around. The character lives a solitary life inside a cave on Mt. Crumpet with only his loyal dog, Max, for company and only sees the residents of Who-Ville when he goes into town to shop. The Grinch soundtrack comes out on November 9th, the same day the movie hits theaters, but you can get an early taste with the Tyler, the Creator and Danny Elfman's take on Thurl Ravenscroft's "You're A Mean One, Mr. Grinch" below, thanks to the Illumination YouTube channel.